It’s always interesting to see a band work outside of the realm of the traditional three or four piece set. 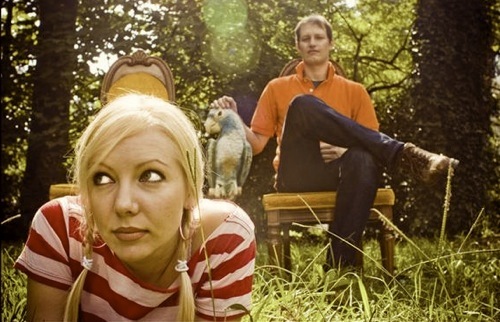 North Carolina’s The Rosebuds have been functioning as a two-person outfit since the release of their 2003 debut, Make Out. Though they hire additional players for the studio and subsequent tours, the band’s albums, including their fourth full-length and latest, Life Like, have had a consistent feel about them – even when they shift styles. AD sat down with The Rosebuds’ Ivan Howard to talk about the jump from the polarizing Night of the Furies to the new album, what a typical promotional season for an album is like in 2009, touring with fellow North Carolinians Megafaun and whether or not they harbor nefarious ambitions to get on best-of lists. Aquarium Drunkard: Let’s travel back to Night of the Furies for a moment. People had different reactions to it, both in the press and fans. As someone who’d followed y’all for awhile, it even threw me when I first listened to it. How did you feel about the press reaction to the album? You knew you were making something different from what you’d been doing, so were you prepared for those reactions? Ivan Howard: Yeah, we definitely were. That’s kind of the reason why we did it. When it came out, I was like, “people are going to hate this.” But I love it. It’s my favorite record that we’ve done. Now, looking back, I think people accepted it way more than I thought they would. I’m not really sure. When it came out, “Get Up, Get Out,” the single, was released to the presses and it kind of took off in the blog world. I heard three or four reviews that were sort of negative, but everything they said was bad was good in my book. But I think it was well received. As far as the new one, Life Like, I think that’s the record that would’ve come after Birds Make Good Neighbors if we didn’t make Night of the Furies so different. That tended to make the people who liked Birds.. more content, but the people who liked ..Furies are wondering where the dance beats went. AD: That’s where I was going with the questions – the new record seems to have more in common with Birds.. than ..Furies. Was there any sort of conscientious decision to go back to something on the new album? IV: I think it was kind of the same thought process as ..Furies. We put that record out and dance beats were in vogue, 16th high-hats and stuff like that, were really popular. With Life Like I didn’t want to do anything like that, nothing popular. I wanted to do the opposite. So instead of putting a lot of electronic drums, we used a lot of live drums and acoustic guitars. And actually two of the songs from Life Like are from the ..Furies session..
IV: “Border Guards” and “Bow to the Middle.” We kinda just pick and choose. All of the songs on ..Furies are based around the song “Night of the Furies.” So when Life Like came out, we’d based everything around that title track. I thought people might want some really heavy dance beats, but I wasn’t going to give it to them this time. AD: It makes sense that you would say “Bow to the Middle” came from the ..Furies session since it’s one of the danciest songs you guys have recorded. If I were a club DJ I’d put that on.. AD: You intercepted another of my questions – I was going to ask if “Bow to the Middle” had its lyrical origins in the recent election, but you said it goes back to the ..Furies era. What did you have in mind in writing it? IH: It actually goes back to the last [Presidential] election. You know, Kerry lost in 2004 and we were really pissed because he kind of lost his gut. He folded and tried to play the middle, appeal to everybody and he blew it for himself. Kelly [Crisp; bandmate] actually wrote most of the words to that song. It was her deal. But it was years after the fact – this was 2006 when we wrote the song. We had just gotten back from Europe and had everybody questioning us and thinking we were like George Bush and we found ourselves explaining ourselves. It re-awoke some of that anger we had. It could really fit into any election though. That’s what all politicians do, pretty much. AD: I decided for myself at some point that I had given up on every really identifying with a presidential candidate because they have to run to the middle so much, it would never really represent me. IH: You do. Everybody’s so different. People who want to be president, the ego you have to have is amazing. I don’t think you can relate to those people. You have to find the least common denominator and go with that. AD: You mean you didn’t think you could sit down and have a beer with George [W.] Bush? IH: [laughs] I probably could, actually. When Obama came to Raleigh, he actually came to the bar we always go to and had a beer with a couple of construction workers. It was kind of weird. So I guess you can have a beer with anyone, anytime. AD: What’s a typical promotional season for an indie record now? How do you get out and promote an indie record in this age of music? IH: Here’s how it used to be. You’d turn your record in and the masters finished six months before the due date, then the label sent it out to magazines. That process has been really shortened because there aren’t really many magazines left anyway, and the only ones that need two months lead time are the giant ones. And if you’re going to do an article with a giant like Rolling Stone or something, you would’ve already done that interview before the album was finished probably. ‘Cause they don’t really care what the record actually sounds like, they just want the interview. But now you can actually make your own rules up. This new one came out October 10th and we had turned it in in June or July. That’s still four months, but it never really got promoted until a couple of months before. They send one song out to blogs and then you can slowly put videos out. But for us, it’s put the record out, hopefully people like it and then go on tour and remind people how fun our shows are. So we’ve done a U.S. tour and we’re doing an East Coast tour in January and maybe another tour in April. AD: I saw a video on Muzzle of Bees where you guys came off-stage to do “Nice Fox” as an encore. Has that song been going over really well with the audience? IH: It does. Whenever we do that kind of [sing along] stuff, it goes over really well. It’s really weird. A lot of people say that’s their favorite song on the record, so we like for everyone to sing [the refrain] with us, but sometimes they won’t do it. I just assume they would because I would at a show, but sometimes with Megafaun [recent tour partners], we’ll have them come do it with us. But with those guys, we’re such good friends, they’ll play banjo and harmonica and we’ll just do it ourselves. You never know what’s going to happen. AD: How has touring with Megafaun been? You guys are not exactly bands I’d compare with one another..
IH: On record, definitely not. I had that question, too. But I don’t think we’ve had a more engaging opening band. I haven’t seen one person really go, “Hmm, not for me.” Even if a lot of their stuff is kind of out there to a normal listener. I was trying to describe it to someone the other day. It’s so well – the foundation of all their songs and music and ability to play instruments – is so well laid out and expertise so high, they can pretty much do anything and it’ll sound good. It’ll never be boring. They’ll take you to that point and you’ll think you can’t take it anymore and then it’ll be the prettiest three minutes, vocal harmonizing, you’ve ever heard. In the next ten minutes they’ll be in the crowd singing along and then the next five hitting a heavy groove. A lot of bands can’t do the simple things they do very well. So it never had a problem. We were so sad when they left that tour. They got the crowd ready to go every time. I never expected it. AD: I’ll be seeing you guys in a week in Chapel Hill with them. Are they doing the rest of that East Coast tour with you as well? IH: They’re playing with us in Charlotte the night before also. Brad [Cook] from Megafaun is going to be our bass player on the tour. It’s really weird. We knew them because they were part of Deyarmond Edison, which was Justin Vernon from Bon Iver’s old band, and Justin was our touring guitar player during the ..Furies tour. And we didn’t even know the Megafaun guys, but when Justin moved away, I started playing basketball with some of those guys and I finally listened to their music and was pretty blown away. It’s hard sometimes to hear music when you’re constantly surrounded by it. It’s a big family tree. AD: The new record came out in October which is kind of late in the year. Do musicians ever think about when they release a record in terms of whether they’re shooting for a year-end best-of list? Like the way there’s an Oscar season in films..
IH: I know exactly what you’re saying. Yeah, this one was released kind of late in the year and some people still haven’t heard it. It was kind of late in the year. Night of the Furies was released in April and was on a bunch of lists.. AD: It’s almost like there’s a time that’s too early – if it comes out in January, February it’s too early and people forget about – or if it comes out too late, people don’t get it in time. You think “October, you’ve got two months,” but it takes time for something to saturate..
IH: There are a lot of records coming out constantly. The number of albums coming out, even compared to three years ago, is amazing. But I thought about it when I read the year end lists and I thought “do people even know Life Like is out?” [laughs] Kelly and I have talked about that and thought maybe we shouldn’t release a record late in the fall again. AD: I just wondered if people actually thought about that. IH: Not really. I think it’s all based on the touring season. We toured in November and that’s almost too late because people have been touring all fall and then you start to hit bad weather. So when you put a record out in October, you kind of have to give people a month to listen to it. So it was almost late, but our fall tour was good. I think this next tour will go really well because people will have heard the record. AD: I feel like I’ve noticed this in bands – will you be less likely to play songs off of ..Furies this time since you spent all last tour playing them? IH: I don’t know. You have so many songs – I think we have 60 songs. You kind of have to choose stuff that matches the personnel in the band at the time since we have a rotating cast. A lot of drummers can’t drum the stuff on ..Furies. So we’ll get a drummer whose stronger point might be the more rock oriented stuff or we get a fourth member who can do more of the acoustic textures that we can’t do as a trio. It kind of makes it interesting for us. It never gets boring. We’ve probably played “Back to Boston” [from the debut, Make Out] a thousand times, but it’s never the same. I think on this next tour we’re going to play a lot of old stuff. It’s kind of hard to play some of the deeper cuts at some of the bigger shows because there are so many different types of fans there. I have this problem of wanting to please everyone. I’m a big fan of Spoon and anytime I go see them I want to hear stuff off of Girls Can Tell, but I never do. But I understand. AD: You really want bands to pull out those tracks. If they’ve got a deep enough catalogue there’s always that hope. + Download The Rosebuds via eMusic’s no risk 25 Free MP3 trial offer. Great interview. Life Like is an amazing record. The title track alone on the opening/title track is worth the price of admission. One of my favorite bands both on record and in concert.